Perfect for my childrens Christmas gift! Bought these personalized ornaments for my niece and nephew. They were so nice and I'm sure they were very surprised to see something with their names on it. this ornament is just that----beautiful in it's simplicity! I love bells for Christmas, and this gift expresses the Christmas season so well. Beautifully done! Beautiful. Such a good find. Got one for each of my grandchildren 10 yrs ago. Just ordered 2 more for new grandbabies. Same design & quality. Matches the ones I got in 2007. Purchased a dozen of these bells in silver and I loved them. The only problem was that the names and dates were off-center on 4 of them and when I called to try to have some done correctly they were no longer in stock. If you want these next year, buy them early. My son loss all his personal ornaments in a fire & I'm secretly replacing them for him. This silver bell is so pretty & having his name and a year on it is wonderful. Christmas bells a real hit !! This gift is for my 1st great-grandchild and my 1st born granddaughter loved it for her 1st born child. I bought for of these engraved bell ornaments years ago from Miles Kimball for my own children. Now that the grandchildren have started arriving I am keeping up the tradition and giving them their own bells. These new ones are even heavier with a beautiful font for engraving. Very happy with them. Memento of Christmases past for my daughters through their 18th birthday. As a Christmas tradition to hang it on the tree. Over 15 years of buying this dated bell. This is a Christmas tradition for my son to get a bell with his name and date. We are very pleased with the bell! I have been getting these ornaments for 13 years now. I started when my son was born and now every year (although he could care less about decorating the tree) he insists on putting on his ornaments. We have created a great memory and tradition. Yes same quality I am used to. An annual gift to my great grand daughters. HARK HOW THE BELLS, SWEET SILVER BELLS! I HAVE BEEN GIVING OUT THESE SILVER BELLS FOR OVER 5YRS AS CHRISTMAS GIFTS TO MY FRIENDS AND FAMILY AND EVERYONE LOVES THEM. ITS AN INEXPENSIVE BUT BEAUTIFUL GIFT THAT WILL LAST A LIFE TIME, AND EVERYTIME THEY PUT ON THIER TREE THEY WILL ALWAYS REMEMBER YOU. STORAGE HINT: WRAP THEM IN TISSUE PAPER AN KEEP THEM IN THEIR BOX. I was pleased with the product and the engraving. Each Christmas I give each of the children and grandchildren a silver bell engraved with the year it was given. This year with your adding names along with the year made it more personal. Thank you. got this for a gift. Really like it. Both of my daughters loved it. I am doing a special ornament each year for my daughters and they loved this for their tree. Putting the year on it made it even more special. This is the perfect first Christmas gift for a new baby and his big sister. We use silver bells to remember highlights in our year! They are a wonderful family tradition for weddings. births, and every single Christmas!!! The bell is a tradition in our family. My children's families have gotten one for 18 years. They are displayed different ways. Some on a special tree and others on a large mirror on a piece of furniture. They look forward to receiving it every year. I always give these engraved bells to grandchildren. They love them and hang them on their tree. This was beautiful. Loved the engraving and the quality overall. I give a .bell to my daughters every xmas.Have been doing so for 20 yrs.started buying from you 3 yrs ago. yours are the best. Purchased a bell at Christmas with name of a new Grandchild and "birth" year. Eight years later I now have 5 beautiful grandchildren and 5 bells hanging on our Christmas tree. Kids think is is cool to find their own bell on the tree. Purpose was that way in the future they will take their "own" bell and place it on their own tree as a "keepsake" of fun times at G.Ma & G.Pa's house. I bought three of these as Christmas gifts for my cousins families with their name and the year engraved on them. They were beautiful and the engravings made them a great personalized gift for a reasonable price! I purchased this for my first grandchild as the first of many annual ornaments selected for her. This was a beautiful first addition! Bought two of these bells with names engraved of mom and mother-in-law, both of who passed away this past year. Used as memorial on the Christmas tree. Ordering it since 2009 when my twin grandsons were born, hey love Nana's Christmas bells. I have purchased this product for nine years. I first purchased this bell for my granddaughter the year she was born. I have purchased one for her every year. She is nine now and especially enjoys having her own silver bells with her name and the year on them. She decorates her own small tree in her bedroom window with these bells, twinkling clear lights, and a red and silver ribbon as a topper. I have purchased my personalized family Chritmas ornaments from Miles Kimbel for several years now & have always been satisfied with the products. I always look @ other sites & usually always come back to M K. Low postage always influences my purchase. Great Gift for New Grandbaby! I am giving this engraved bell to our son and dtr-in-law as part of their Christmas gifts to honor the birth of our newest grandchild. It is a family tradition to give engraved silver items for new family members! I was pleasantly surprised when I received this item! Very beautiful and great quality. I have all my children and grandchildren a bell with their birth year on it and they love looking for their bells on our tree. This is a gift and I was very pleased with it. I've purchased these bells for the last 14 years for my 3 nieces and close friends girls. 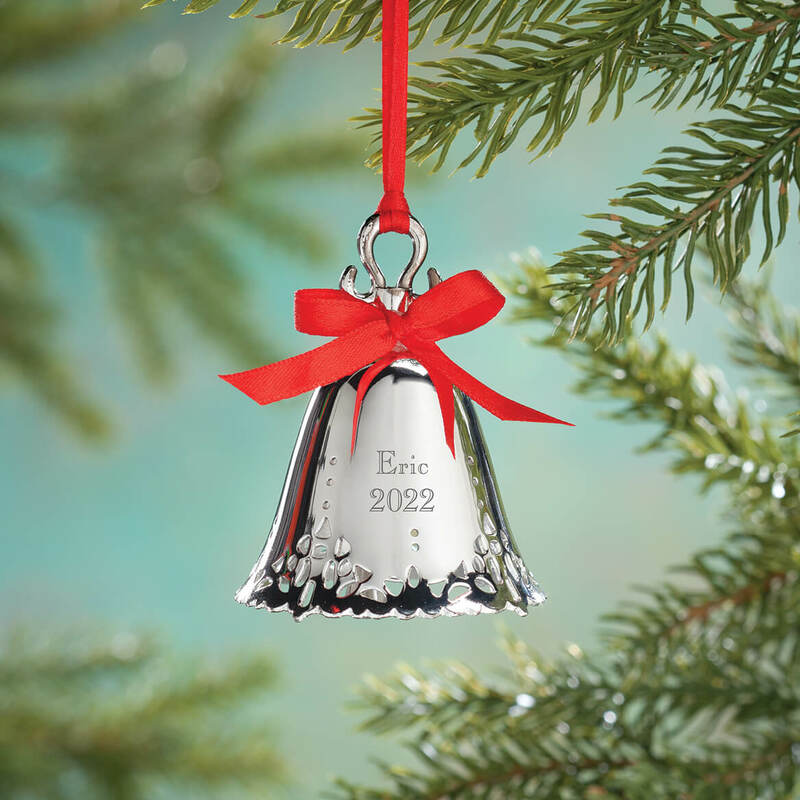 They make a great heirloom ornament for each child and when they grow up and have their own home and tree, they can start their decorations with these bells. I have been buying these little bells for 20 yrs. I hang them above my front door. We enjoy looking at them. this is the second year in a row I have ordered this engraved christmas bell for my daughter and son-in-law. they want this to be a tradition. Product came very quickly especialy considering the engraving. It's not a super good quality one, but very good for the price. I plan to continue to order this in the coming years to keep up the tradition for their tree. This is the best ornament ever! Great product. Very attractive and much larger than I had expected. Great deal too! Satisfaction guaranteed. I buy these every Christmas for my 3 children as gifts.. They look very nice as Christmas decorations. I always have the year engraved on each one . They are a tradition at my house. Tradition and the loveliness of the bell and the meaning. I get this Bell Ornament (dated) every year! This is for my daughter and son-in-law to hang on their Christmas tree. I got their 2 boys other ones in different colors. The reason for chooseing the silver bell was it has a classic look to it. Reminds me of the song "Silver Bells" and wanted something that really said Christmas to the recipients. My daughter's last day of radiation and she get's to ring the bell! This bell with date is for my daughter. She's alive and cancer free. I have given one of these to my Granddaughter since she was one year old. She is now a young adult and still loves her personalized Christmas bells. Very classic ornament that's appropriate for commemorating a wedding. THEY SUIT EACH PERSON SELECTED TO RECEIVE THE ORNAMENTS !!! My second grandchild will get this silver ornament for his Xmas this year. I bought one for me and my husband and our four children. Bells hold a special significance in our family, they mean "I love you". Miles Kimball brand is reliable. Fit my price range. I bought four of these for 3 granddaughters and a daughter for Christmas. Bought 2 others las year, for an addition to the family. My mother got these for our children for years. Time to pass along the tradition to our grandchildren. It is a family tradition to have the bells with the year on it. Fell behind at getting them. Have order these before and are quality items. I give these personalized Silver Plated Christmas Bell Ornaments to my family members at our Thanksgiving Dinner every year. I have purchased these yearly for many years. They are a Christmas tradition for my three children who are now grown with children of their own. I thought it was a classic timeless look for an ornament that would make for a nice customized ornament for my friend's children that they can hang on the tree year after year as they grow. A nice way to memorialize the family's first Christmas together. I get them every year! I had silver bells for my children and am now getting them for my grandchildren. Each year when they are put on the tree they hold a special memory. ideal for grown grandchildren and their family on the tree. Like that they can be personalized. BEST ANSWER: i am no jeweller (i wish!) but have now ordered 4 of these bells for each of our grandchildren. The first was bought 5 years ago and it still looks lovely. My guess would be no - not at that price. But it looks lovely, has a reasonable weight and heft to it; it does not seem "cheap". The box it comes in is another story - you will want to repackage it. I don't think it's real silver but it looks very nice and top shelf. Nothing makes a child happier than seeing a decoration on the tree with their name on it. Makes one feel like they really belong there. I give every year and by the time the chil's 18 they will have lots of decorations for their own Christmas tree. I believe it is, some of the older bells I have purchased in the past are slightly tarnishing. 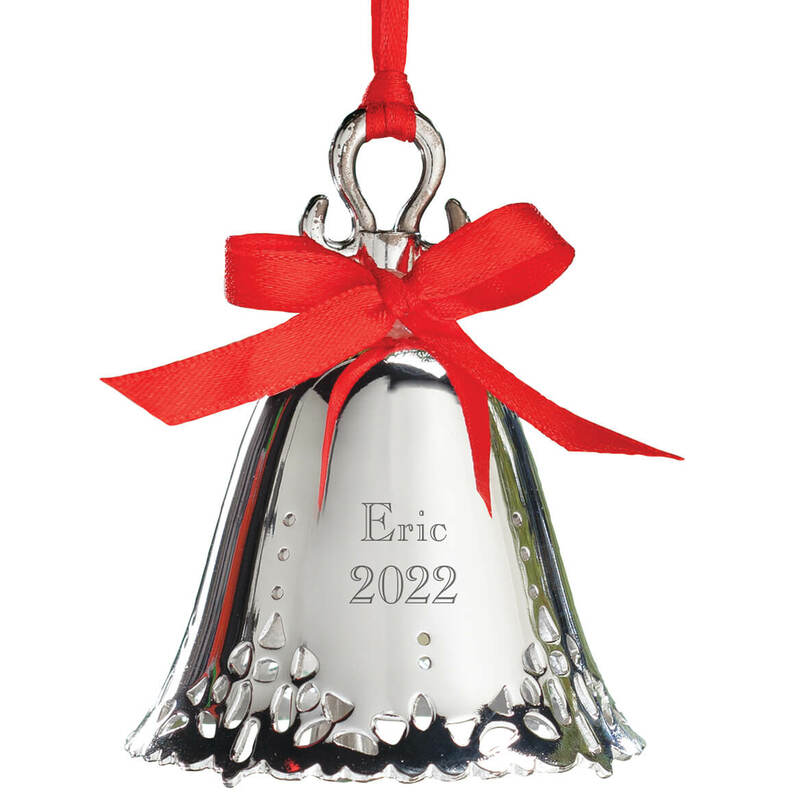 Am thoroughly pleased with personalized silver bell ornament. is the bell silver plate. Is it thin? BEST ANSWER: yes it is thin but no thinner than any other christmas bell at this price. I have been buying these bells for 11 years now and only two have had the clapper fall out in all that time. They have been played with by my grandchildren every christmas one every year they have been born plus one for their birthdate. Yes, however it is sturdy. I have gotten my father one every year for 20 years and they hold up just fine. I have searched hard and wide for a reasonably priced silver bell over these years. Unless you are looking to spend $100+, you will not find a better option. It is silver plated. I don't think it is thin. I have bought four others before this one and have been pleased with all. I have one for each of my grandsons with the year they were born. I think you would be happy with this purchase. I believe it is silver plate, but it is not thin. It is a very nice bell ornament for the Christmas tree. I have been happy with the ones we have. I don't feel that it's thin. I think it has some weight to it. I assume it's plated. YES, IT'S SILVER PLATED, I THINK. AND, NOT THIN AT ALL. IT'S REALLY PRETTY!! DO THESE COME IN INDIVIDUAL GIFT BOXES? Yes they do. I get one every year for my children. Yes the bell comes in a box. If it isn't Personalized, does it still have the year on it? BEST ANSWER: Thank you for your question. If no personalization is provided no personalization will be engraved, including the year. If you want just the year on the ornament you will need to provide the year for the personalization. We hope this information will be of help to you. I don't think so. The year is part of your personalizing instructions. I have actually ordered them for different past years and needed to specify the year for each as part of the instructions. Only if you request it. I bought for several years into the future. Yes, you can order the bell with only the year. BEST ANSWER: The website says that the maximum for the Name is 15 characters and maximum for the year is 4 characters. You will find this info after you click the Personalized choice when you're ordering the bell. Thank you for your question. There is a total of 15 letters/spaces. We hope this information will be of help to you. Are these bells metal or plastic in the core? I know they are either silver or gold plated, but over what material? BEST ANSWER: These are all metal, the core is metal. I hope this helps. I love these and have ordered them every year since my kiddos were born. This will be my 14th year. Bells are all metal...very pretty sound too and have held up well over the years. Just plastic, but they are very nice! Do the silver bells tarnish? BEST ANSWER: Thank you for your question. Over time, it can tarnish. It will depend on the how often it is handled and stored. We hope this information will be of help to you. When will this bell be available again? Lots of babies here and on the wa. Always given as a baby gift. BEST ANSWER: Thank you for your question. The ornaments will be back in stock during the Winter of 2017. We hope this information will be of help to you. Does it come in gold ? BEST ANSWER: Thank you for your question. We do carry a similar bell in Gold Plated Christmas Bell Ornament. The item number is 353280. We hope this information will be of help to you. BEST ANSWER: Thank you for your question. At this time any personalized item takes 6-10 business days. We hope this information will be of help to you. Where do I specify the engraving if I am ordering online?